Hola todos!! How are you doing?? Hope you all have a good day with lots of love and happiness. We’re fine here, even my husband is tired these days because he has lots of work to do…but we’re happy and healthy. Today’s post is a recipe from Italy. 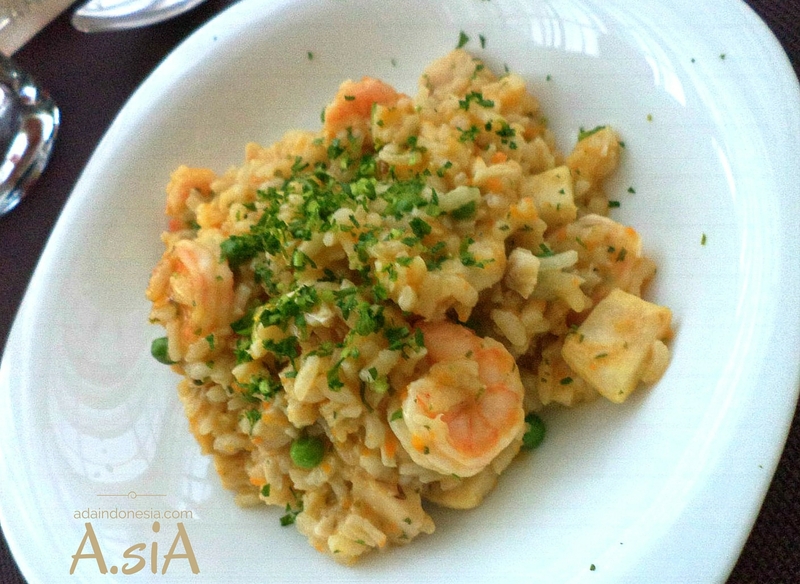 I want to post this recipe of Risotto, because it’s a delicious food and the ingredients is not difficult to find. Risotto is a North Italian rice dish cooked in a broth to a creamy consistency. It is one of the common way to cook rice in Italy. The based of the broth can be from meat, fish, or vegetable. It is normally served as the first course before the main course. Let’s try to make it….happy cooking! Clean the prawn and squid, and make score on the squid and cut into bite size. Chopped onion, celery, carrot, and garlic and saute in pan with some olive oil. After 5 minute, put squid and prawn. Saute for a while and pour 1/2 glass of white wine. Cook until the white wine evaporated and the squid is half cooked. Turn off the stove and set aside. In a pot, saute onion in low heat. When the onion become transparent, put the rice inside the pot. Saute the rice for a while, then pour the other 1/2 glass of wine. When the wine evaporated, pour 1 ladle of fish stock and stir constantly. Add also some salt and pepper (but not too much, especially if your stock is already salty). When the stock absorbed, pour again 1 ladle of fish stock. Repeat all until the stock is finish. Put peas, prawn and squid around 5-7 minutes before it’s finish to cook. Mix it thouroughly. Finally taste your risotto, add some salt or pepper if needed. Turn off the heat and let it rest for about 5 minutes. Serve it while it’s hot. At first, I was thinking that it’s difficult to make risotto, but if you follow the recipe and cook it with patient, I’m sure you can do it!Thank you for visiting our website. We love to hear from you, so please leave your comment down bellow.